Peregrine Travel is the exclusive partner for Cathay Pacific Airways’ China Experience Tours and Customized Tours to all of Asia from the USA. In 2010, Peregrine Travel Group was honored to be appointed by China to serve as the exclusive distributor for the 2010 Shanghai World Expo tickets in the United States. When you work with Peregrine Travel Group, you are tabbing into our vast resources and strong expertise. Rest assured that Peregrine Travel Group will work hard to earn your repeat business as well as referrals. Morning: Huangshizhai, (yellow stone stronghold), the largest view stand in Zhangjiajie provides numerous lookout points for stunning views; from here you can see nearly half the peaks of Zhangjiajie. 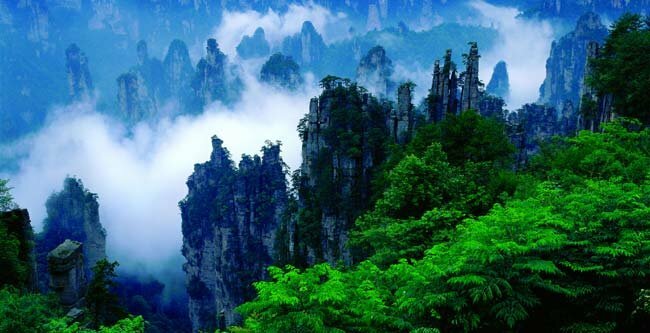 There is a popular saying that if you don’t visit Huangshizhai, you can’t claim you have come to Zhangjiajie. Story telling by your guide is a lot of fun. Huangshizhai provides the convenience of a cable car. Hiking on Huangshizhai is a great challenge (but flexible according to your hiking ability). Afternoon: Golden Whip Brook is reputed to be the most beautiful canyon in the world. Your tour guide will tell beautiful stories about the golden whip related to China’s first emperor and Great Buddha -Guanyin. Three hours of hiking come to an end at Shuiraosimen, where four streams converge. Morning: Yuanjiajie. The Adventure tour starts at Shuiraosimen (four streams converge here). The Bailong Elevator — an engineering wonder of the world — is located here. At a height of 326 meters, and claimed to be the world’s highest outdoor elevator, it takes 1.58 seconds to transport tourists from the bottom to the Yuanjiajie top, where they can enjoy unbelievable and fantastic views. Afternoon: Tianzi Mountain means Kings Mountain in English, because its Tujia minority chief-Xiang Dakuns uprising in Ming dynasty 500 years ago recorded in the history. Xiang Dakun is honored as a king. In Tianzi Mountain, the huge forests of pillars stand foursquare against the distant blue hills, announcing them to be the very treasures that UNESCO declares them to be. Tianzi Mountain presents itself in its distinctive shape; the rock formation is older than that in Yuanjiajie; the summit provides a fantastic experience of stunning views. Against the backdrop of sunset, the Tianzishan cable car will transport you down the mountain and return to your hotel. Tujia Folk Custom Park: Covering an area of over 5 hectares (slightly over 12 acres), Tujia Folk Custom Park is a large-scale cultural tourist attraction, built mainly to demonstrate various aspects of the Tujia people’s folk customs, including architecture, food, agriculture and military art. Most of the buildings in Zhangjiajie Tujia Folk Custom Park are constructed of wood and stone, with such characteristics as carved girder, painted columns and upturned eaves. The exquisite workmanship and ingenious construction have been greatly acclaimed by tourists, who have also expressed much admiration of the splendid culture and magnificent folk customs displayed in the park. Morning: Yellow Dragon Cave is the longest cave in Asia; it is an incomparable realm of gigantic subterranean chambers, fantastic cave formations, and extraordinary features. Today, many of the wonders of Yellow Dragon Cave are well known, yet the experience of exploring its chambers is every bit as exciting. The cave remained mystic to local villagers before the first caving adventure took place in 1982; they believed it was the holy home for the yellow dragon and spirits. Now the routes are well paved and well lighted. Sturdy walking shoes, flashlights, and water are required when you explore the cave. Afternoon: In the afternoon, discover Baofeng Lake, Embraced by continuous mountains, the artificial Baofeng Lake (Treasure-Peak Lake) was created in the 1970s people as people filled the small faults of the lake with concrete to store water and bring the water level up. This was the birth of a beautiful lake. The boat tour on the lake gives a lot of fun with the folk songs by girls in the boat, the tourists are expected to interact with the folk song girls by “cross singing.” The permanent waterfall at the entrance is a wonder. Your unforgettable trip ends and transportation is provided to Zhangjiajie airport.